Hemel Hempstead Town striker Oliver Hawkins is set for a move to League Two side Dagenham & Redbridge, the Gazette understands. The Tudors have accepted an undisclosed bid from the Daggers, with Hawkins due to discus personal terms and undertake his medical today. We are delighted with how we developed him and now it’s his time to go on and become a league footballer. New Daggers manager John Still has been a long-time admirer of the 23-year-old centre-forward, having tracked his progress during his time as Luton Town boss. Hawkins has eight National League South goals to his name so far this season, with the tall striker having arguably been Hemel’s stand-out player during the first half of the campaign. 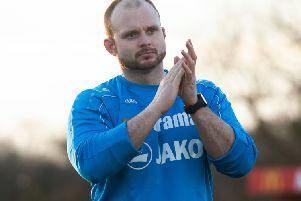 Speaking about the imminent move, Hemel manager Dean Brennan said: “We’ve accepted a bid and it’s a fantastic opportunity for the player; he’s a player we have believed in for a long, long time and a player we have put a lot of faith in. He’s done fantastically well for us. “He needed to believe in himself a little bit more and he started to do that as he got more game time, and I think the decision we made two years ago to make him our main centre-forward has proved correct. “This is a fantastic opportunity for a 23-year-old centre-forward who basically we pulled off the park. In terms of what it means to the club, Brennan continued: “It’s fantastic for the football club – before I got here the football club had never sold a player, and now this is the 15th player we have sold. That’s what we said we would do when we got here. “I don’t know how much we got for him because I didn’t have a lot to do with it, but the offer wouldn’t have been accepted if it wasn’t a good deal for the club. Hawkins joined Hemel from Northwood in 2013 after impressing manager Dean Brennan during a pre-season trial. He was voted the Northwood Supporters’ Player of the Year for 2011/12 and Manager’s Player of the Year for 2012/13, during which time he was golden boot winner for both seasons, scoring 19 goals in each campaign.